Q. What type of deleted email can be recovered? A. 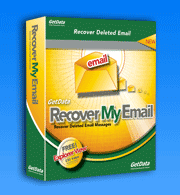 Recover My Email will recover deleted messages from all versions of Microsoft Outlook (.pst files) and all versions of Microsoft Outlook Express (.dbx files). Other email file formats may be added at a later time. Q. Can Recover My Email open corrupt email files? A. Yes, Recover My Email will enable access to corrupt or damaged Outlook or Outlook Express files that cannot be otherwise opened by Outlook or Outlook Express. Q. Can Recover My Email recover attachments? A. Yes, Recover My Email will recover email attachments. When you perform a recovery email attachments can be viewed in the search results screen. Q. What is the difference between the evaluation version and the full version? A. There is no difference, other than once Recover My Email has been activated it will allow you to save the search results. Q. Can all deleted email messages be recovered? A. It is not always possible to recover all deleted email messages. Once a message is deleted it can usually be recovered up until such time that the message gets overwritten and destroyed by other data. Whether this happens is largely out of the control of the user as it depends on many factors such as the size of the email file and how often it gets used. The best way to determine what messages can be recovered is to run the evaluation version and examine the search results. Q. How do I know if my email messages can be recovered? If you can view the message and message attachments that you are trying to recover in the results screen, then they can be recovered. If you cannot view the message or attachments then they cannot be recovered. There is no difference in the search results once the program is activated. The only additional feature of the full version is that it will allow you to save your search results. Q. How do I get recovered Outlook messages back into my Outlook? A.Recovered Outlook message can easily be copied back into your current message folders. Learn how to do this here. Q. How do I get recovered Outlook Express messages back into my Outlook Express? A. Save messages as .eml files. Open Outlook Express and then drag and drop the .eml files back into the Outlook Express inbox. Do you have a question that should be included here? Please send us an email.